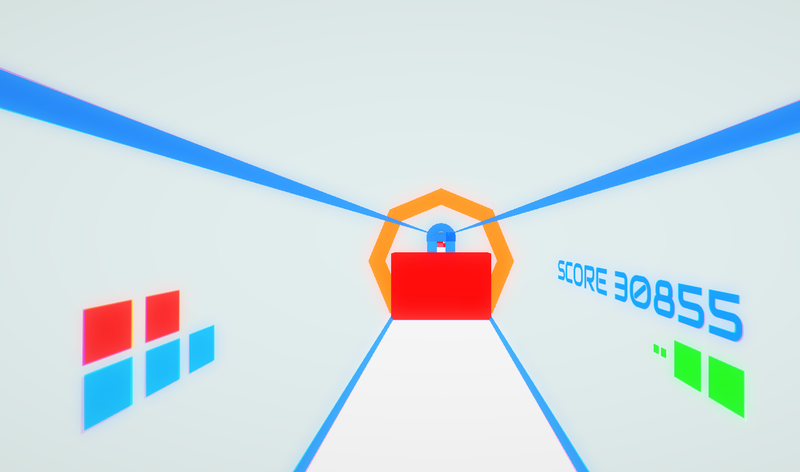 A lot has changed about Hyper Gauntlet since the v0.8.11, both visible changes as well as under the hood. The vignette system is fully working and is also now powering slow motion. What does this mean? It means that if you hit space while the game is in slow motion for another reason (e.g. after you hit an obstacle), then you won’t suddenly rocket back to normal speed. It’ll remember what state of slow motion it was meant to be in. At the same time, I’ve refreshed the user interface. There should now be no bugs at all in the high score boards, the volume slider should work flawlessly and has been given a new style, and you can now change your name after you’ve first set it by going into the preferences menu. Further to that, I’ve vastly improved reflex controls mode and it should now be a much smoother experience. Additionally it should now be impossible to exploit the system and jump outside of the game grid. If you still get this happening or any other bugs for that matter, then I urge you to please tell me about it! I’ve also added a new sound and changed the layout of the multipliers in the user interface. I’m not sure I like it or not, so please send me a message telling me what you think about it. Oh, and the quit button should actually work now. My bad. What are you waiting for, go play it! This entry was posted in News on November 15, 2013 by Nick.